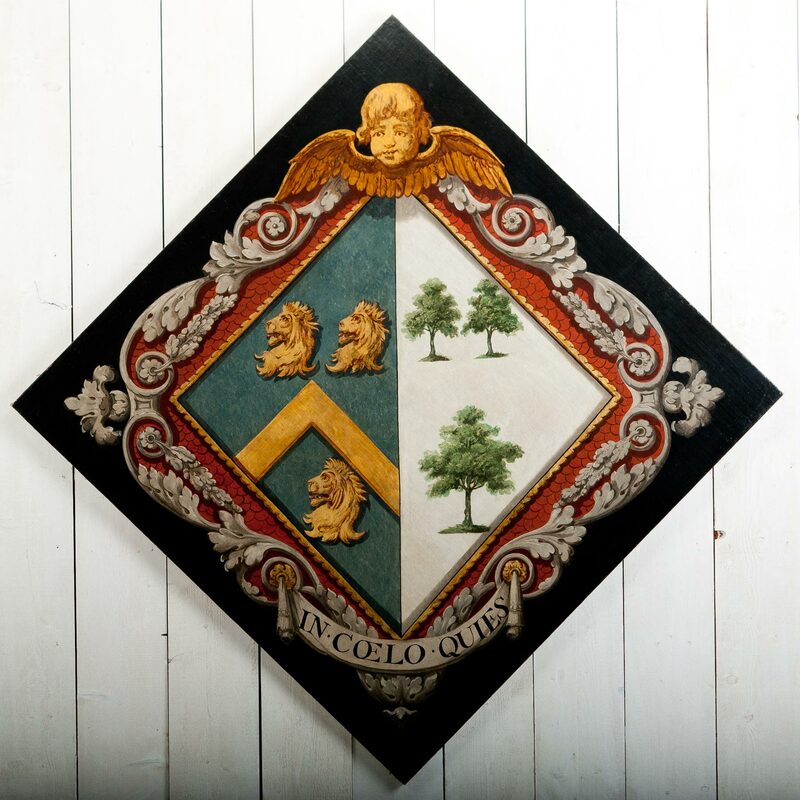 A Funeral Achievement or Hatchment is a lozenge shaped painted Coat of Arms. It is placed on the front of the house on the morning of interment, where it generally remains for twelve months, and thence is removed and frequently put up in the Church. The Hatchment of a Peer is known by his Coronet, Mantle, etc., that of a Baronet by his Badge. A Knight is signified by his Helmet, or Badge and Motto of his Order; a Bishop by the Mitre, etc. To distinguish what party is dead, the ground on which the arms are painted, is represented either black or white, or one side white, the other black. Thus the Arms of a Bachelor, Maid, Widow and Widower, are painted upon a black ground. When a married woman dies, her husband still surviving, the sinister half of the ground is painted black, the dexter white. If a married man dies, and his wife survives, the ground is painted the reverse. In many instances, instead of the family motto, the words "In cœlo quies" (In Heaven There Is Rest) or "Resurgam" are placed on the Hatchment. Oil on canvas.English circa 1800.